The case has been considered, since the early stages of the police investigation, "one of Australia's most profound mysteries." There has been intense speculation ever since regarding the identity of the victim, the cause of his death and the events leading up to it. Public interest in the case remains significant for several reasons: the death occurred at a time of heightened international tensions following the beginning of the Cold War; the apparent involvement of a secret code; the possible use of an undetectable poison; and the inability of authorities to identify the dead man. In addition to intense public interest in Australia during the late 1940s and early 1950s, the Tamám Shud case also attracted international attention. South Australian Police consulted their counterparts overseas and distributed information about the dead man internationally, in an effort to identify him. International circulation of a photograph of the man and details of his fingerprints yielded no positive identification. For example, in the United States, the FBI was unable to match the dead man's fingerprint with prints taken from files of domestic criminals. Scotland Yard was also asked to assist with the case, but could not offer any insights. On 1 December 1948 at 6:30 am, the police were contacted after the body of a man was discovered on Somerton beach near Glenelg, about 11 kilometres (6.8 mi) southwest of Adelaide, South Australia. The man was found lying in the sand across from the Crippled Children's Home, which was on the corner of The Esplanade and Bickford Terrace. He was lying back with his head resting against the seawall, with his legs extended and his feet crossed. It was believed he had died while sleeping. An unlit cigarette was on the right collar of his coat. A search of his pockets revealed an unused second-class rail ticket from Adelaide to Henley Beach, a bus ticket from the city that could not be proved to have been used, a narrow aluminium American comb, a half-empty packet of Juicy Fruit chewing gum, an Army Club cigarette packet containing seven cigarettes of a different brand, and a quarter-full box of Bryant & May matches. Witnesses who came forward said that on the evening of 30 November, they had seen an individual resembling the dead man lying on his back in the same spot and position near the Crippled Children's Home where the corpse was later found. A couple who saw him at around 7 pm noted that they saw him extend his right arm to its fullest extent and then drop it limply. Another couple who saw him from 7:30 pm to 8 pm, during which time the street lights had come on, recounted that they did not see him move during the half an hour in which he was in view, although they did have the impression that his position had changed. Although they commented between themselves that it was odd he was not reacting to the mosquitoes, they had thought it more likely that he was drunk or asleep, and thus did not investigate further. One of the witnesses told the police she observed a man looking down at the sleeping man from the top of the steps that led to the beach. Witnesses said the body was in the same position when the police viewed it. Another witness came forward in 1959 and reported to the police that he and three others had seen a well-dressed man carrying another man on his shoulders along Somerton Beach the night before the body was found. A police report was made by Detective Don O'Doherty. According to the pathologist, John Burton Cleland, the man was of "Britisher" appearance and thought to be aged about 40–45; he was in "top physical condition". He was "180 centimetres (5 ft 11 in) tall, with grey eyes, fair to ginger-coloured hair, slightly grey around the temples, with broad shoulders and a narrow waist, hands and nails that showed no signs of manual labour, big and little toes that met in a wedge shape, like those of a dancer or someone who wore boots with pointed toes; and pronounced high calf muscles consistent with people who regularly wore boots or shoes with high heels or performed ballet." He was dressed in a white shirt; a red, white and blue tie; brown trousers; socks and shoes; a brown knitted pullover and fashionable grey and brown double-breasted jacket of reportedly "American" tailoring. All labels on his clothes had been removed, and he had no hat (unusual for 1948) or wallet. The body was clean-shaven and carried no identification, which led police to believe he had committed suicide. His teeth did not match the dental records of any known living person. An autopsy was conducted, and the pathologist estimated the time of death at around 2 a.m. on 1 December. The heart was of normal size, and normal in every way ...small vessels not commonly observed in the brain were easily discernible with congestion. There was congestion of the pharynx, and the gullet was covered with whitening of superficial layers of the mucosa with a patch of ulceration in the middle of it. The stomach was deeply congested... There was congestion in the second half of the duodenum. There was blood mixed with the food in the stomach. Both kidneys were congested, and the liver contained a great excess of blood in its vessels. ...The spleen was strikingly large ... about 3 times normal size ... there was destruction of the centre of the liver lobules revealed under the microscope. ... acute gastritis hemorrhage, extensive congestion of the liver and spleen, and the congestion to the brain. The autopsy showed that the man's last meal was a pasty eaten three to four hours before death, but tests failed to reveal any foreign substance in the body. The pathologist Dr. Dwyer concluded: "I am quite convinced the death could not have been natural ... the poison I suggested was a barbiturate or a soluble hypnotic". Although poisoning remained a prime suspicion, the pasty was not believed to be the source of the poison. Other than that, the coroner was unable to reach a conclusion as to the man's identity, cause of death, or whether the man seen alive at Somerton Beach on the evening of 30 November was the same man, as nobody had seen his face at that time. The body was then embalmed on 10 December 1948 after the police were unable to get a positive identification. The police said this was the first time they knew that such action was needed. On 14 January 1949, staff at the Adelaide railway station discovered a brown suitcase with its label removed, which had been checked into the station cloakroom after 11:00 a.m. on 30 November 1948. It was believed that the suitcase was owned by the man found on the beach. 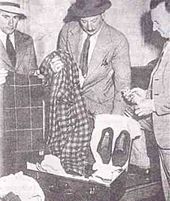 In the case were a red checked dressing gown; a size-seven, red felt pair of slippers; four pairs of underpants; pyjamas; shaving items; a light brown pair of trousers with sand in the cuffs; an electrician's screwdriver; a table knife cut down into a short sharp instrument; a pair of scissors with sharpened points; a small square of zinc thought to have been used as a protective sheath for the knife and scissors and a stencilling brush, as used by third officers on merchant ships for stencilling cargo. Also in the suitcase was a thread card of Barbour brand orange waxed thread of "an unusual type" not available in Australia—it was the same as that used to repair the lining in a pocket of the trousers the dead man was wearing. All identification marks on the clothes had been removed but police found the name "T. Keane" on a tie, "Keane" on a laundry bag and "Kean" (without the last e) on a singlet, along with three dry-cleaning marks; 1171/7, 4393/7 and 3053/7. Police believed that whoever removed the clothing tags either overlooked these three items or purposely left the "Keane" tags on the clothes, knowing Keane was not the dead man's name. With wartime rationing still enforced, clothing was difficult to acquire at that time. Although it was a very common practice to use name tags, it was also common when buying secondhand clothing to remove the tags of the previous owner/s. What was unusual was that there were no spare socks found in the case, and no correspondence, although the police found pencils and unused letter stationery. Police checked incoming train records and believed the man had arrived at the Adelaide railway station by overnight train from either Melbourne, Sydney or Port Augusta. They speculated he had showered and shaved at the adjacent City Baths (there was no Baths ticket on his body) before returning to the train station to purchase a ticket for the 10:50 a.m. train to Henley Beach, which, for whatever reason, he missed or did not catch. He immediately checked his suitcase at the station cloak room before leaving the station and catching a city bus to Glenelg. Although named the City Baths, the centre was not a public bathing facility but a public swimming pool. The railway station bathing facilities were adjacent to the station cloak room, which itself was adjacent to the station's southern exit onto North Terrace. The City Baths on King William St. were accessed from the station's northern exit via a lane way. There is no record of the station's bathroom facilities being unavailable on the day he arrived. An inquest into the death, conducted by coroner Thomas Erskine Cleland, commenced a few days after the body was found but was adjourned until 17 June 1949. The investigating pathologist John Burton Cleland re-examined the body and made a number of discoveries. Cleland noted that the man's shoes were remarkably clean and appeared to have been recently polished, rather than being in the state expected of the shoes of a man who had apparently been wandering around Glenelg all day. He added that this evidence fitted in with the theory that the body might have been brought to Somerton beach after the man's death, accounting for the lack of evidence of vomiting and convulsions, which are the two main effects of poison. Thomas Cleland speculated that as none of the witnesses could positively identify the man they saw the previous night as being the same person discovered the next morning, there remained the possibility the man had died elsewhere and had been dumped. He stressed that this was purely speculation as all the witnesses believed it was "definitely the same person" as the body was in the same place and lying in the same distinctive position. He also found there was no evidence as to who the deceased was. Cedric Stanton Hicks, Professor of physiology and pharmacology at the University of Adelaide, testified that of a group of drugs, variants of a drug in that group he called "number 1" and in particular "number 2" were extremely toxic in a relatively small oral dose that would be extremely difficult if not impossible to identify even if it had been suspected in the first instance. He gave the coroner a piece of paper with the names of the two drugs which was entered as Exhibit C.18. The names were not released to the public until the 1980s as at the time they were "quite easily procurable by the ordinary individual" from a chemist without the need to give a reason for the purchase. (The drugs were later publicly identified as digitalis and ouabain, both of which are cardenolide-type cardiac glycosides.) He noted the only "fact" not found in relation to the body was evidence of vomiting. He then stated its absence was not unknown but that he could not make a "frank conclusion" without it. Hicks stated that if death had occurred seven hours after the man was last seen to move, it would imply a massive dose that could still have been undetectable. It was noted that the movement seen by witnesses at 7 p.m. could have been the last convulsion preceding death. Early in the inquiry, Cleland stated "I would be prepared to find that he died from poison, that the poison was probably a glucoside and that it was not accidentally administered; but I cannot say whether it was administered by the deceased himself or by some other person." Despite these findings, he could not determine the cause of death of the Somerton Man. Cleland remarked that if the body had been carried to its final resting place then "all the difficulties would disappear". 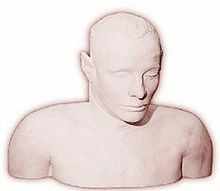 After the inquest, a plaster cast was made of the man's head and shoulders. The lack of success in determining the identity and cause of death of the Somerton Man had led authorities to call it an "unparalleled mystery" and believe that the cause of death might never be known. Around the same time as the inquest, a tiny piece of rolled-up paper with the words "Tamám Shud" printed on it was found in a fob pocket sewn within the dead man's trouser pocket. Public library officials called in to translate the text identified it as a phrase meaning "ended" or "finished" found on the last page of the Rubaiyat of Omar Khayyam. The paper's verso side was blank. Police conducted an Australia-wide search to find a copy of the book that had a similarly blank verso. A photograph of the scrap of paper was released to the press. Following a public appeal by police, the copy of the Rubaiyat from which the page had been torn was located. A man showed police a 1941 edition of Edward FitzGerald's (1859) translation of the Rubaiyat, published by Whitcombe and Tombs in Christchurch, New Zealand. [note 2] Detective Sergeant Lionel Leane, who led the initial investigation, often protected the privacy of witnesses in public statements by using pseudonyms; Leane referred to the man who found the book by the pseudonym "Ronald Francis" and he has never been officially identified. "Francis" had not considered that the book might be connected to the case until he had seen an article in the previous day's newspaper. On the inside back cover of the book, detectives identified indentations from handwriting. These included a telephone number, an unidentified number, and a text that resembled an encrypted message. According to statements by police, the book was found in the rear footwell of a car, at about the same time that the body of the unidentified man had been found. The handwriting found in the back of a book of the Rubáiyát of Omar Khayyám. The text is presumed to be some sort of code. The theme of the Rubaiyat of Omar Khayyam is that one should live life to the fullest and have no regrets when it ends. The poem's subject led police to theorise that the man had committed suicide by poison, although there was no other evidence to back the theory. The book was missing the words "Tamám Shud" on the last page, which had a blank reverse, and microscopic tests indicated that the piece of paper was from the page torn from the book. Also, in the back of the book were faint indentations representing five lines of text, in capital letters. The second line has been struck out – a fact that is considered significant, due to its similarities to the fourth line and the possibility that it represents an error in encryption. In the book it is unclear whether the first line begins with an "M" or "W", but it is widely believed to be the letter W, owing to the distinctive difference when compared to the stricken letter M. There appears to be a deleted or underlined line of text that reads "MLIAOI". Although the last character in this line of text looks like an "L", it is fairly clear on closer inspection of the image that this is formed from an 'I' and the extension of the line used to delete or underline that line of text. Also, the other "L" has a curve to the bottom part of the character. There is also an "X" above the last 'O' in the code, and it is not known if this is significant to the code or not. Initially, the letters were thought to be words in a foreign language before it was realised it was a code. Code experts were called in at the time to decipher the lines but were unsuccessful. In 1978, following a request from ABC-TV journalist Stuart Littlemore, Department of Defence cryptographers analysed the handwritten text. The cryptographers reported that it would be impossible to provide "a satisfactory answer": if the text was an encrypted message, its brevity meant that it had "insufficient symbols", from which a clear meaning could be extracted, and the text could be the "meaningless" product of a "disturbed mind". An unlisted telephone number was also found in the back of the book, belonging to a nurse named Jessica Ellen "Jo" Thomson (1921–2007) – born Jessie Harkness in the Sydney suburb of Marrickville – who lived in Moseley St, Glenelg, about 400 metres (1,300 ft) north of the location where the body was found. When she was interviewed by police, Thomson said that she did not know the dead man or why he would have her phone number and choose to visit her suburb on the night of his death. However, she also reported that, at some time in late 1948, an unidentified man had attempted to visit her and asked a next door neighbour about her. In his book on the case, Gerry Feltus stated that when he interviewed Thomson (2002), he found that she was either being "evasive" or she "just did not wish to talk about it". 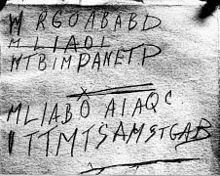 Feltus believed Thomson knew the Somerton man's identity. Thomson's daughter Kate, in a television interview (2014) with 60 Minutes, also said that she believed her mother knew the dead man. In 1949, Jessica Thomson requested that police not keep a permanent record of her name or release her details to third parties, as it would be embarrassing and harmful to her reputation to be linked to such a case. The police agreed – a decision that hampered later investigations. In news media, books and other discussions of the case, Thomson was frequently referred to by various pseudonyms, including the nickname "Jestyn" and names such as "Teresa Johnson née Powell". Gerry Feltus (2010) claimed he was given permission by Thomson's family to disclose her names and that of her husband, Prosper Thomson. Nevertheless, the names Feltus used in his book were pseudonyms. Feltus also stated that her family did not know of her connection with the case, and he agreed not to disclose her identity or anything that might reveal it. Her real name was considered important as the possibility exists that it may be the decryption key for the purported code. When she was shown the plaster cast bust of the dead man by Detective Sergeant Leane, Thomson said she could not identify the person depicted. According to Leane, he described her reaction upon seeing the cast as "completely taken aback, to the point of giving the appearance that she was about to faint". In an interview many years later, Paul Lawson – the technician who made the cast and was present when Thomson viewed it – noted that after looking at the bust she immediately looked away and would not look at it again. There has been persistent speculation that the dead man was a spy, due to the circumstances and historical context of his death. One such theory concerns Alf Boxall, who was reportedly involved in intelligence work during and immediately after World War II. In a 1978 television interview Stuart Littlemore asks: "Mr Boxall, you had been working, hadn't you, in an intelligence unit, before you met this young woman [Jessica Harkness]. Did you talk to her about that at all?" In reply, Boxall says "no", and when asked if Harkness could have known, Boxall replies "not unless somebody else told her." When Littlemore suggests in the interview that there may have been an espionage connection to the dead man in Adelaide, Boxall replies: "It's quite a melodramatic thesis, isn't it?" Boxall's army service record suggests that he served initially in the 4th Water Transport Company, before being seconded to the North Australia Observer Unit (NAOU) – a special operations unit – and that during his time with NAOU, Boxall rose rapidly in rank, being promoted from Lance Corporal to Lieutenant within three months. 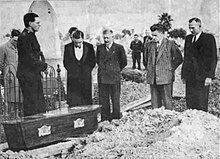 Burial of the Somerton Man on 14 June 1949. By his grave site is Salvation Army Captain Em Webb, leading the prayers, attended by reporters and police. In 1949, the body of the unknown man was buried in Adelaide's West Terrace Cemetery, where The Salvation Army conducted the service. The South Australian Grandstand Bookmakers Association paid for the service to save the man from a pauper's burial. On 22 November 1959 it was reported that an E.B. Collins, an inmate of New Zealand's Wanganui Prison, claimed to know the identity of the dead man. There have been numerous unsuccessful attempts in the 60 years since its discovery to crack the letters found at the rear of the book, including efforts by military and naval intelligence, mathematicians, and amateur code crackers. In 2004, retired detective Gerry Feltus suggested in a Sunday Mail article that the final line "ITTMTSAMSTGAB" could stand for the initials of "It's Time To Move To South Australia Moseley Street..." (the former nurse lived in Moseley Street which is the main road through Glenelg). A 2014 analysis by computational linguist John Rehling strongly supports the theory that the letters consist of the initials of some English text, but finds no match for these in a large survey of literature, and concludes that the letters were likely written as a form of shorthand, not as a code, and that the original text can likely never be determined. In 1994 John Harber Phillips, Chief Justice of Victoria and Chairman of the Victorian Institute of Forensic Medicine, reviewed the case to determine the cause of death and concluded that "There seems little doubt it was digitalis." Phillips supported his conclusion by pointing out that the organs were engorged, consistent with digitalis, the lack of evidence of natural disease and "the absence of anything seen macroscopically which could account for the death". Former South Australian Chief Superintendent Len Brown, who worked on the case in the 1940s, stated that he believed that the man was from a country in the Warsaw Pact, which led to the police's inability to confirm the man's identity. The South Australian Police Historical Society holds the bust, which contains strands of the man's hair. Any further attempts to identify the body have been hampered by the embalming formaldehyde having destroyed much of the man's DNA. Other key evidence no longer exists, such as the brown suitcase, which was destroyed in 1986. In addition, witness statements have disappeared from the police file over the years. A number of possible identifications have been proposed over the years. An Adelaide newspaper, The Advertiser, on reporting the discovery of the body, gave the possible identification as "E.C. Johnson, about 45, of Arthur St, Payneham". The following day, 3 December 1948, Johnson identified himself at a police station. That same day, another Adelaide newspaper, The News, published a photograph of the dead man on its front page, leading to additional calls from members of the public about the possible identity of the dead man. By 4 December, police had announced that the man's fingerprints were not on South Australian police records, forcing them to look further afield. On 5 December, The Advertiser reported that police were searching through military records after a man claimed to have had a drink with a man resembling the dead man at a hotel in Glenelg on 13 November. During their drinking session, the mystery man supposedly produced a military pension card bearing the name "Solomonson". In early January 1949, two people identified the body as that of 63-year-old former wood cutter Robert Walsh. A third person, James Mack, also viewed the body, initially could not identify it, but an hour later he contacted police to claim it was Walsh. Mack stated that the reason he did not confirm this at the viewing was a difference in the colour of the hair. Walsh had left Adelaide several months earlier to buy sheep in Queensland but had failed to return at Christmas as planned. Police were skeptical, believing Walsh to be too old to be the dead man. However, the police did state that the body was consistent with that of a man who had been a wood cutter, although the state of the man's hands indicated he had not cut wood for at least 18 months. Any thoughts that a positive identification had been made were quashed, however, when Elizabeth Thompson, one of the people who had earlier positively identified the body as Walsh, retracted her statement after a second viewing of the body, where the absence of a particular scar on the body, as well as the size of the dead man's legs, led her to realise the body was not Walsh. By early February 1949, there had been eight different "positive" identifications of the body, including two Darwin men who thought the body was of a friend of theirs, and others who thought it was a missing station worker, a worker on a steamship or a Swedish man. Detectives from the state of Victoria initially believed the man was from there because of the similarity of the laundry marks to those used by several dry-cleaning firms in Melbourne. Following publication of the man's photograph in Victoria, 28 people claimed to know his identity. Victorian detectives disproved all the claims and said that "other investigations" indicated it was unlikely that he was a Victorian. By November 1953, police announced they had recently received the 251st "solution" to the identity of the body from members of the public who claimed to have met or known him. But, they said that the "only clue of any value" remained the clothing the man wore. In 2011, an Adelaide woman contacted biological anthropologist Maciej Henneberg about an identification card of an H. C. Reynolds that she had found in her father's possessions. The card, a document issued in the United States to foreign seamen during World War I, was given to Henneberg in October 2011 for comparison of the ID photograph to that of the Somerton man. While Henneberg found anatomical similarities in features such as the nose, lips and eyes, he believed they were not as reliable as the close similarity of the ear. The ear shapes shared by both men were a "very good" match, although Henneberg also found what he called a "unique identifier;" a mole on the cheek that was the same shape and in the same position in both photographs. "Together with the similarity of the ear characteristics, this mole, in a forensic case, would allow me to make a rare statement positively identifying the Somerton man." Decryption of the "code" was being started from scratch.[when?] It had been determined the letter frequency was considerably different from letters written down randomly; the frequency was to be further tested to determine if the alcohol level of the writer could alter random distribution. The format of the code also appeared to follow the quatrain format of the Rubaiyat, supporting the theory that the code was a one-time pad encryption algorithm. Copies of the Rubaiyat, as well as the Talmud and Bible, were being compared to the code using computers to get a statistical base for letter frequencies. However, the code's short length meant the investigators would require the exact edition of the book used. With the original copy lost in the 1960s, researchers have been looking for a FitzGerald edition without success. On the left is the Somerton man's ear, showing that the upper hollow (cymba) is larger than the lower hollow (cavum). On the right is a normal ear, showing that the upper hollow is typically much smaller. The Somerton man's ear type is possessed by only 1–2% of the Caucasian population and is an important clue to narrowing down his identity. It is possible that any lost relatives may have this feature. An investigation had shown that the Somerton Man's autopsy reports of 1948 and 1949 are now missing and the Barr Smith Library's collection of Cleland's notes do not contain anything on the case. Maciej Henneberg, professor of anatomy at the University of Adelaide, examined images of the Somerton man's ears and found that his cymba (upper ear hollow) is larger than his cavum (lower ear hollow), a feature possessed by only 1–2% of the Caucasian population. In May 2009, Derek Abbott consulted with dental experts who concluded that the Somerton Man had hypodontia (a rare genetic disorder) of both lateral incisors, a feature present in only 2% of the general population. In June 2010, Abbott obtained a photograph of Jessica Thomson's eldest son Robin, which clearly showed that he – like the unknown man – had not only a larger cymba than cavum but also hypodontia. The chance that this was a coincidence has been estimated as between one in 10,000,000 and one in 20,000,000. The media have suggested that Robin Thomson, who was 16 months old in 1948 and died in 2009, may have been a child of either Alf Boxall or the Somerton Man and passed off as Prosper Thomson's son. DNA testing would confirm or eliminate this speculation. Abbott believes an exhumation and an autosomal DNA test could link the Somerton man to a shortlist of surnames which, along with existing clues to the man's identity, would be the "final piece of the puzzle". However, in October 2011, Attorney General John Rau refused permission to exhume the body, stating: "There needs to be public interest reasons that go well beyond public curiosity or broad scientific interest." Feltus said he was still contacted by people in Europe who believed the man was a missing relative but did not believe an exhumation and finding the man's family grouping would provide answers to relatives, as "during that period so many war criminals changed their names and came to different countries". In July 2013 Abbott released an artistic impression he commissioned of the Somerton man, believing this might finally lead to an identification. "All this time we've been publishing the autopsy photo, and it's hard to tell what something looks like from that", Prof Abbott said. In December 2017, Abbott announced three "excellent" hairs "at the right development stage for extracting DNA" had been found on the plaster cast of the corpse, and had been submitted for analysis to the Australian Centre for Ancient DNA at the University of Adelaide. Processing the results could reportedly take up to a year. In November 2013 relatives of "Jestyn" gave interviews to the television current affairs program 60 Minutes. Kate Thomson, the daughter of Jessica and Prosper Thomson, said that her mother was the woman interviewed by the police and that her mother had told her she had lied to them – Jessica did know the identity of the "Somerton Man" and his identity was also "known to a level higher than the police force". Her father had died in 1995 and mother had died in 2007. Kate Thomson suggested that her mother and the "Somerton Man" may both have been spies, noting that Jessica Thomson taught English to migrants, was interested in communism, and could speak Russian, although she would not disclose to her daughter where she had learned it, or why. Robin Thomson's widow, Roma Egan, and their daughter Rachel Egan, also appeared on 60 Minutes suggesting that the "Somerton Man" was Robin Thomson's father and, therefore, Rachel's grandfather. 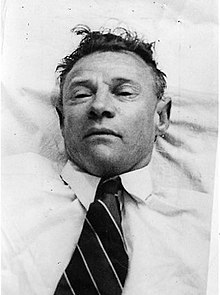 The Egans reported lodging a new application with the Attorney-General of South Australia, John Rau, to have the Somerton Man's body exhumed and DNA tested. Derek Abbott also subsequently wrote to Rau in support of the Egans, saying that exhumation for DNA testing would be consistent with federal government policy of identifying soldiers in war graves, to bring closure to their families. Kate Thomson opposed the exhumation as being disrespectful to her brother. circa 1905: Somerton Man is born, according to the coroner's report. August 1945: Jessica Harkness gives Alf Boxall an inscribed copy of the Rubaiyat over drinks at the Clifton Gardens Hotel, Sydney prior to his being posted overseas on active service. The inscription is signed "JEstyn". circa October 1946: Jessica Harkness's son Robin is conceived (assuming a normal duration pregnancy). July 1948: "Prosper McTaggart Thomson, hire car proprietor, of Moseley Street, Glenelg" appears in Adelaide Local Court as defendant in a car sale dispute, dating from November 1947, establishing Prosper Thomson as active in Adelaide from 1947. Between 8:30 a.m. to 10:50 am: There is no satisfactory explanation for what The Somerton Man did during these hours. There is no record of the station's bathroom facilities being unavailable and no ticket in his pocket to suggest he had visited the Public Baths, outside of the station. after 11:15 am: Buys a 7d bus ticket on a bus that departed at 11:15 a.m. from the south side of North Tce (in front of the Strathmore Hotel) opposite the railway station. He may have boarded at a later time elsewhere in the city as his ticket was the sixth of nine sold between the railway station and South Tce; however, he only had a 15-minute window from the earliest time he could have checked his suitcase (the luggage room was around 60 metres from the bus stop). It is not known which stop he alighted at; the bus terminated at Somerton at 11:44 am and enquiries indicated that he "must have" alighted at Glenelg, a short distance from the St. Leonard's hotel. This stop is less than 1 kilometre (3,300 ft) north of the Moseley St address of Jessica Thomson, which was itself 400 metres from where the body was found. 1 December 2 a.m.: Estimated time of death. The time was estimated by a "quick opinion" on the state of rigor mortis while the ambulance was in transit. As a suspected suicide, no attempt to determine the correct time was made. As poisons affect the progression of rigor, 2 a.m. is probably inaccurate. 6–14 June: The piece of paper bearing the inscription "Tamám Shud" is found in a concealed fob pocket. 22 July: A man hands in the copy of the Rubaiyat he had found on 30 November (or perhaps a week or two earlier) containing an unlisted phone number and mysterious inscription. Police later match the "Tamám Shud" paper to the book. 26 July: The unlisted phone number discovered in the book is traced to a woman living in Glenelg (Jessica Thomson, previously Harkness). Shown the plaster cast by Paul Lawson, she did not identify that the man was Alf Boxall, or any other person. Lawson's diary entry for that day names her as "Mrs Thompson" and states that she had a "nice figure" and was "very acceptable" (referring to the level of attractiveness) which allows the possibility of an affair with the Somerton man. She was 27 years old in 1948. In a later interview Lawson described her behaviour as being very odd that day. She appeared as if she was about to faint. Jessica Harkness requests that her real name be withheld because she didn't want her husband to know she knew Alf Boxall. Although she was in fact not married at this time, the name she gave police was Jessica Thomson with her real name not being discovered until 2002. Early 1950: Prosper Thomson's divorce is finalised. 18 May 1953: death of Horace Charles Reynolds, Tasmanian man born in 1900 and regarded by some investigators as the owner of the "H.C. Reynolds" ID card. 14 March 1958: The coroner's inquest is continued. The Thomsons and Alf Boxall are not mentioned. No new findings are recorded and the inquest is ended with an adjournment sine die. 1986: The Somerton Man's brown suitcase and contents are destroyed as "no longer required". In June 1945 – three years before the death of the Somerton Man – a 34-year-old Singaporean named George Marshall (born Joseph Saul Haim Mashal) was found dead in Ashton Park, Mosman, Sydney, with an open copy of the Rubaiyat of Omar Khayyam on his chest. Ashton Park is directly adjacent to Clifton Gardens. His death is believed to be a suicide by poisoning, and occurred two months before Harkness gave Boxall the inscribed copy of the Rubaiyat. Marshall was a brother of David Marshall, who was later to become Singapore's first Chief Minister. An inquest was held on 15 August 1945; Gwenneth Dorothy Graham testified at the inquest and was found dead 13 days later face down, naked, in a bath with her wrists slit. On 6 June 1949, the body of two-year-old Clive Mangnoson was found in a sack in the Largs Bay sand hills, about 20 kilometres (12 mi) up the coast from Somerton. Lying next to him was his unconscious father, Keith Waldemar Mangnoson. [note 6] The father was taken to a hospital in a very weak condition, suffering from exposure; following a medical examination, he was transferred to a mental hospital. The Mangnosons had been missing for four days. The police believed that Clive had been dead for twenty-four hours when his body was found. The two were found by Neil McRae[note 7] of Largs Bay, who claimed he had seen the location of the two in a dream the night before. The coroner could not determine the young Mangnoson's cause of death, although it was not believed to be natural causes. The contents of the boy's stomach were sent to a government analyst for further examination. Following the death, the boy's mother, Roma Mangnoson, reported having been threatened by a masked man, who, while driving a battered cream car, almost ran her down outside her home in Cheapside Street, Largs North. Mrs Mangnoson stated that "the car stopped and a man with a khaki handkerchief over his face told her to 'keep away from the police or else.'" Additionally a similar-looking man had been recently seen lurking around the house. Mrs. Mangnoson believed that this situation was related to her husband's attempt to identify the Somerton Man, believing him to be Carl Thompsen, who had worked with him in Renmark in 1939. Soon after being interviewed by police over her harassment, Mrs. Mangnoson collapsed and required medical treatment. J. M. Gower, secretary of the Largs North Progress Association received anonymous phone calls threatening that Mrs. Mangnoson would meet with an accident if he interfered while A. H. Curtis, the acting mayor of Port Adelaide received three anonymous phone calls threatening "an accident" if he "stuck his nose into the Mangnoson affair". Police suspect the calls may be a hoax and the caller may be the same person who also terrorised a woman in a nearby suburb who had recently lost her husband in tragic circumstances. A body, believed to be of E.C. Johnson, about 45, of Arthur St, Payneham, was found on Somerton Beach, opposite the Crippled Children's Home yesterday morning. The discovery was made by Mr J. Lyons, of Whyte Rd, Somerton. Detective H. Strangway and Constable J. Moss are enquiring. The News, an afternoon tabloid, featured their story of the man on its first page, giving more details of the dead man. As one journalist wrote in June 1949, alluding to the line in the Rubaiyat, "the Somerton Man seems to have made certain that the glass would be empty, save for speculation." An editorial called the case "one of Australia's most profound mysteries" and noted that if he died by poison so rare and obscure it could not be identified by toxicology experts, then surely the culprit's advanced knowledge of toxic substances pointed to something more serious than a mere domestic poisoning. Episode 3 of the second series of The Doctor Blake Mysteries, "A Foreign Field", draws heavily on the case. The story included a mysterious victim found slumped dead in a public place, a suitcase of clothes found in a railway station locker with all labels removed, a page of a poem used with a secret code and even the victim's last meal being a pasty. The case was covered by Casefile True Crime Podcast in Case 2: The Somerton Man, aired in January 2016. The Colorado Kid, a mystery novel by Stephen King, makes reference to a case that mirrors the Tamam Shud Case almost exactly, except it is set in Maine. Australian rock band Tamam Shud gets its name from this case. The Perth band The Drones' 2015 song "Taman Shud" frequently refers to the case and the unidentified man. The band's adjoining album Feelin Kinda Free utilises an image of the code found in the back of The Rubaiyat in the album artwork. Australian-European black/thrash metal band Deströyer 666 featured a song about the case, titled "Tamam Shud", on their 2016 album Wildfire. Episode 9 of the second series of the dystopian science fiction drama Colony is named after the case. Episode 50 of the podcast My Favorite Murder discussed this case. The case was covered on Episode 31 of the podcast Don't Have Cows (DHC) hosted by Melbourne-based comedian, Luke Hand. ^ While the words that end The Rubaiyat are "Tamám Shud" (تمام شد), it has often been referred to as "Taman Shud" in the media, because of a spelling error in early newspaper coverage or police reports which has persisted. In Persian, تمام tamám is a noun that means "the end" and شد shud is an auxiliary verb indicating past tense, so tamam shud means "ended" or "finished". ^ However, a bus conductor named Leslie Francis Wytkin (or Wytkins) handed in a copy of the Rubaiyat to the Metropolitan Tramways Trust, at around the same time; it is not clear whether this was the same copy of the Rubaiyat, or an extraneous find, and/or if Wytkin was "Francis". ^ Boxall was born in London on 16 April 1906, enlisted in the Australian Army on 12 January 1942 and was not discharged until 12 April 1948. "World War II Nominal Roll, "Boxall, Alfred". Australian War Memorial. Retrieved 8 December 2008. ^ In July 1947, Jessica "Jestyn" Harkness gave birth to her son Robin in Melbourne, at which point she was not married. Shortly afterwards she moved to Adelaide and was listed in telephone directories under the surname of her future husband, Prosper Thomson. They may or may not have been cohabiting. Accounts of conversations between Jessica Thomson and police suggest she told them that she was "married" or "recently married". There is no evidence that police knew in 1949 that she was not married. However, the police may have been aware of her domestic arrangements; it was the kind of information that would normally have been of interest to them. After Prosper Thomson's divorce from his first wife had been finalised (in early 1950), Jessica and Prosper Thomson were married in May 1950. ^ Abbott, Derek. "List of facts on the Taman Shud Case that are often misreported". Retrieved 19 November 2018. ^ a b Dash, Mike (12 August 2011). 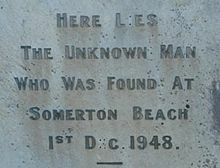 "The Body on Somerton Beach". Smithsonian. Retrieved 18 July 2015. ^ Cleland (1949), p. 9. ^ Cleland (1949), p. 2. ^ a b c d e Feltus (2010). ^ a b Cleland (1949), pp. 12–13. ^ Britten, Nick (1 February 2011). "Top 10 uncracked codes". The Daily Telegraph. Retrieved 10 January 2014. There were no clues as to his identity and dental records and fingerprints matched no living person. ^ Cleland (1949), p. 23. ^ James Fettes (29 October 2013). "Professor's 15-year search for answers seeks to crack the secret code to the death of the 'Somerton man' found on an Adelaide beach". HeraldSun. Retrieved 30 June 2017. ^ a b "15 Jun 1949 – INQUEST TO OPEN ON BODY OF UNKNOWN MAN – ADELAIDE". The Canberra Times. 15 June 1949. Retrieved 27 June 2015 – via Trove. ^ a b Cleland (1949), pp. 1–3. ^ Cleland (1949), pp. 42–44. ^ "New Zealand Book News". Aukland Star. 22 November 1941. p. 12. ^ Feltus (2010), p. 105. ^ "Possible Clue In Somerton Body Case". The Advertiser. 23 July 1949. p. 1. ^ a b c d Inside Story, presented by Stuart Littlemore, ABC TV, screened at 8 pm, Thursday, 24 August 1978. ^ "No Sydney Clue to Dead Man Found at Somerton, S.A." The Canberra Times. 28 July 1949. ^ a b c Feltus (2010), pp. 178–179. ^ Feltus (2010), p. 178. ^ "Jessica Thomson's reaction to the dead man's bust". YouTube. Retrieved 23 May 2010. ^ Feltus (2010), p. 173. ^ Feltus (2010), pp. 177–178. ^ Coghlan (2008), p. 235. ^ "BOXALL ALFRED : Service Number – NX83331". WW2 Military Records. National Archives of Australia. Retrieved 5 December 2013. ^ Pyatt, D. Mystery of the Somerton Man Archived 8 September 2007 at the Wayback Machine, Police Online Journal, Vol. 81, No. 4, April 2000. ^ a b "Body Found on Beach". The Advertiser. Adelaide. 2 December 1948. p. 3. Retrieved 21 August 2013 – via National Library of Australia. ^ "Dead Man Walks into Police H.Q." The News: 2. 2 December 1948. ^ a b ' "Body again "identified"". The News. 52 (7, 957). Adelaide. 4 February 1949. p. 13. Retrieved 22 May 2017 – via National Library of Australia. ^ Feltus (2010), p. 83. ^ "hc reynolds". 2 January 2015. Retrieved 1 December 2018. ^ a b Pelling, Nick (15 March 2013). "Sorry, The Unknown Man is (very probably) not H.C. Reynolds". Cipher Mysteries. Archived from the original on 30 November 2018. Retrieved 30 November 2018. ^ "Cemetery Records Search". Millingtons Funeral Directors & Cemetery Managers. Tasmania, Australia. Retrieved 4 December 2018. Search for Horace Charles REYNOLDS. ^ a b Stateline South Australia, "Somerton Beach Mystery Man", Transcript, Broadcast 27 March 2009. Archived 4 March 2016 at the Wayback Machine. Retrieved 27 April 2009. ^ Stateline South Australia, "Somerton Beach Mystery Man", Transcript, Broadcast 15 May 2009. Archived 16 February 2016 at the Wayback Machine. Retrieved 3 August 2009. ^ "How the Somerton Man played cupid from the grave". 14 December 2017. Retrieved 1 December 2018. ^ Klein, Alice. "Who was the Somerton Man? Solving Australia's coldest case". Retrieved 1 December 2018. ^ a b Castello, Renato (23 November 2013). "New twist in Somerton Man mystery as fresh claims emerge". Herald Sun. Retrieved 26 November 2013. ^ a b Feltus (2010), p. 18. ^ Feltus (2010), p. 20. ^ a b c Feltus (2010), p. 26. ^ Feltus (2010), p. 108. ^ "Doctor Blake meets the Somerton Man (sort of)..." Cipher Myteries. 22 February 2014. Retrieved 15 July 2015. ^ Barclay, Shelly. "The Taman Shud Case," Historic Mysteries (4 Nov 2011). ^ Hann, Michael (12 October 2016). "Tamam Shud – the psychedelic surfers who made a classic album in an hour". The Guardian. Guardian Media Group. Retrieved 15 September 2017. ^ Tan, Monica (23 October 2015). "Gareth Liddiard of the Drones: 'It's time leftwingers grew some balls'". The Guardian. Retrieved 14 September 2016. ^ Wharton, Bryer (3 March 2016). "Review: Destroyer 666 – Wildfire". SLUG Magazine. Eighteen Percent Gray. Retrieved 14 September 2016. ^ McLevy, Alex. "The Bowman family spins into chaos on a game-changing Colony". TV Club. Retrieved 14 January 2018. ^ "Listen to the My Favorite Murder with Karen Kilgariff and Georgia Hardstark Episode – 50 – The Golden Anniversary Episode on iHeartRadio | iHeartRadio". iHeartRadio. Retrieved 14 January 2018. ^ "The End of the Unfinished Beach, by Cats and Cats and Cats". Cats and Cats and Cats. Retrieved 14 January 2018. Cleland, Thomas Erskine (1949). Inquest into the Death of a Body Located at Somerton on 1.12.48. GRG 1/27 File 71/1949, 17 and 21 June 1949 (PDF). State Records of South Australia. Cleland, Thomas Erskine (1958). Inquest into the Death of a Body Located at Somerton on 1.12.48. GRG 1/27 File 53/1958, 14 March 1958 (PDF). State Records of South Australia. Coghlan, Robyn (2008). Connections From London to the Antipodes: The Family of John Boxall and Sarah Hugkulstone. Acme Publishing Co., Hawker, ACT. ISBN 978-0-646-50443-8. Feltus, Gerald Michael (2010). The Unknown Man. South Australia: Klemzig. ISBN 978-0-646-54476-2. Omar Khayyam, The Rubaiyat of Omar Khayyam: First and Fifth Editions, translated by Edward FitzGerald Courier Dover Publications, 1990, ISBN 0-486-26467-X. Wikimedia Commons has media related to Taman Shud Case.